There are quite a number of country singers in America who have had phenomenal success over there but are virtually unknown in the UK. Alan Jackson, Tim McGraw, Loretta Lynn, Kitty Wells, Reba McIntyre, Brad Paisley, George Strait and Kris Krisofferson are just some of the many. The latter of that list has, however, written some well-known songs that have charted for other people, namely Help Me Make It Through the Night, For the Good Times and the 1979 Lena Martell chart-topper One Day at a Time. In America his biggest hit, as a writer, was Janis Joplin’s 1971 number one Me and Bobby McGee. Kristoffer Kristofferson, as he was christened, was born in Texas and will turn 80 later this year. He came from a military background and in the late fifties he was pressured by his family to follow rank and joined the U.S. Army where he would rise to the rank of Captain, he also gained a pilot’s licence and served as a helicopter pilot too. He left the force in 1965 and moved to Nashville. His first job was sweeping floors at Columbia Recording Studios in Nashville, whilst there he met June Carter and asked her to give her husband, Johnny, a tape with some songs he’d written. Cash eventually recorded one of the songs called Sunday Mornin’ Comin’ Down” and that year Kris was rewarded with an award for songwriter of the year at the Country Music Awards. Kris began writing the song in 1969 and before it was finished Roger Miller heard it and wanted to record it first. It wasn’t a great version. Kris finished it and co-credited it to Fred Foster, because as Kris said, “Fred gave it to me as a challenge and without the challenge there would be no song.” Johnny Cash later commented to him that he would regret it. 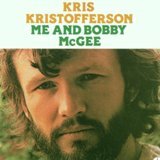 Other versions followed Roger’s, next came a version by American Eagle also in 1969, then Ramblin’ Jack Elliott in 1970 and finally Kris’ own version was released. Gordon Lightfoot also covered it in 1970 and later the same year one of Kris’ former flames, Janis Joplin, arguably made the song famous. Janis had begun recording the album Pearl but on 4th October 1970, she’d died of a heroin overdose before completing it. Her death came less than three weeks after the world had learned of the death of Jimi Hendrix – both were 27. When Joplin hit the top spot in America, she became the second singer to have a posthumous number one, the first being Otis Redding’s (Sittin’ On) the Dock of the Bay exactly three years earlier.